This is the first of a number of related posts where I am recording some of the techniques and ideas I have used in my own garden. People are amazed at the ‘intensive’ nature of our garden. That is, at this time of the year through to the beginning of winter it is crowded with plants at various stages of their cycles. One of the main ways I manage this is with container gardening. By growing our edibles in containers I have managed to solve several of our ‘problems’. Through our mainly ‘natural’ diet we generate a lot of kitchen waste. The garden also creates a huge amount of green material that we cycle back through our system. Initially I set about digging much of this straight into the garden beds themselves. The chooks also got a good look in at selected stuff also. After a while I had the garden planted out and had nowhere to bury the ever-expanding green waste and kitchen scraps. 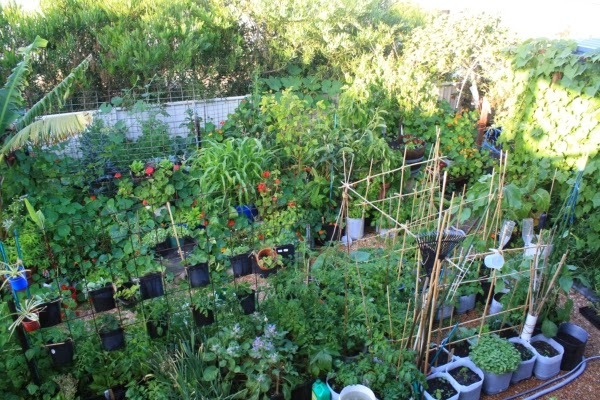 This is when the garden evolved to its current container garden state. As I explain to people, think of these containers as mini worm farms that just happen to be planted out with vegetables, because that is basically what they are. I am well aware that many home gardeners prefer to rip up any bolting plants and start a new garden rather than allow plants to complete their cycle and collect the seeds for future crops. By growing in containers it permits us to retain some of our selected plants and enable them to go to seed so we have seed for the future with the traits we are seeking for our garden and our use. It doesn’t tie up extra planting area and if the plant needs moving I can easily pick it up and move it to another spot in the garden where it is out of the way and can complete its cycle to produce seed. Water preservation and use is important where we live. 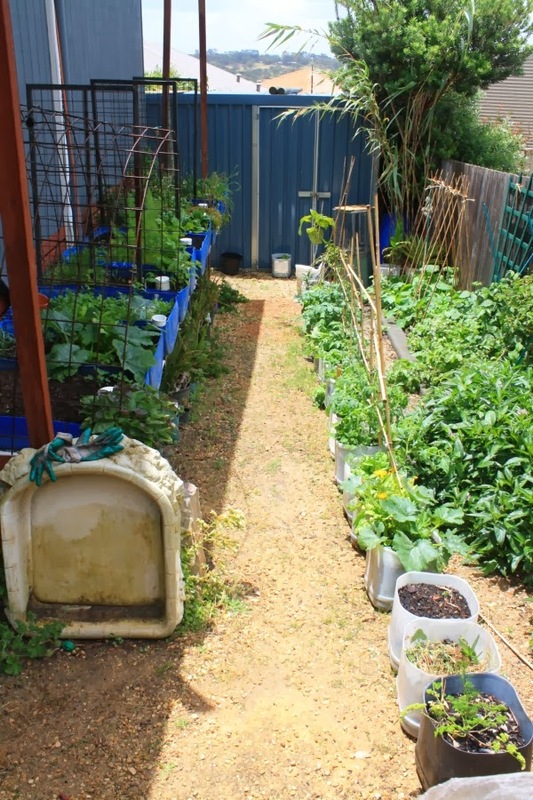 I will concede that containers tend to use more water than the plants would require if planted in the earth, however in our situation we use our greywater which enables me to keep much of the garden (mainly the containers) well watered. I can also tailor the water usage per container if some plants are requiring more than others. This is part of the reason that small gardens like this are able to be so intensively used – we can spend more time observing the intimacies of what is occurring in the garden. Over time, the water retention of the containers is increased as the soil improves. There is very little tilling that occurs. It is more likely that a layer of compost will be added to the container to build up the level again and plant out seeds or seedlings into. Nutrients is better utilised and recycled. Whatever nutrients I add to the containers isn’t easily flushed away, so it is more likely to be present and available when the plants have use for it. Periodically I may tip the soil out into another container to bulk up the soil a bit and start over with more scraps and dirt and a new family of compost worms. Container gardens leave smaller spaces bare. Sometimes between crops I will have a container left in fallow for a short time. Usually this is something like one or two containers among many, so rather than having a large area of ground left bare there may be only a couple of containers scattered amongst others. Visually, this a appealing and pleasing to the eye and makes the garden at joy to look at most times of the year in our climate. Periodically there may be times at the turn of the seasons when there are more containers starting over again, but usually they are not far from making themselves available for seedlings. This brings me to the next point. As with other intensive gardening methods I will also start seedlings in small pots or trays and then plant them out into the containers when ready. If this is managed in good time then there isn’t much of a gap between an empty container and a productive one. Containers can be moved to different spots in the garden according to the needs of the plants it holds. I have banana plants in some containers that are developing and I can move these into sunny parts of the garden depending on the time of year to maximise their exposure to the sun and warmth. This is important for our climate because although it is temperate, some plants in our garden are sub-tropical and do benefit from a bit of special care. Our Babaco (paw paw hybrid) are planted into large containers which they prefer as they don’t like to be too wet. So containers are ideal for such plants that require good drainage. Tomatoes, lettuce and zucchini in various spots. This is very interesting. I do have to agree with the points you raised. Container gardening is indeed a great idea, despite the possibility of using more water for it. I especially like your second tip, which I think is a good point, especially to other people out there who are also thinking of moving into container gardening. Thank you.